Clearing the mist to see the beauty of reality and what is beyond. Then We inspired Musa (Moses) (saying): “Strike the sea with your stick.” And it parted, and each separate part (of that sea water) became like the huge, firm mass of a mountain. Have you ever wondered what significance repetition has in the Quran? Here’s something to think about. In the entire Quran, the name Muhammad is mentioned four times, while Adam is mentioned 25 times, Nuh is mentioned 43 times and Ibrahim is mentioned 69 times. There is one Prophet of Allah whose mention by far exceeds and surpasses all of these, and that is Musa عليه السلام, mentioned in the Quran an astounding 136 times. His story is equally mind-blowing, dispersed in parts throughout the Quran. The famous journey of a small baby from Bani Israel that grew up in the palace of the Pharaoh is one we all know, and the splitting of the Red Sea continues to amaze us to this day. It still bewilders me that the same sea that allowed Musa عليه السلام and his people to walk through safely was the one that drowned the Pharaoh and his followers shortly afterwards. Verily! In this is indeed a sign (or a proof), yet most of them are not believers. And verily, your Lord! He is truly the All-Mighty, the Most Merciful. You might to be wondering: why am I talking to you about Musa عليه السلام? And that’s an excellent question. It was narrated from Ibn ‘Abbaas (may Allah be pleased with him) that when the Prophet (blessings and peace of Allah be upon him) came to Madinah, he found them (the Jews) fasting on one day, i.e., ‘Aashoora’. They said: This is a great day; it is the day on which Allah saved Moosa and drowned the people of Pharaoh, so Moosa fasted in gratitude to Allah. He (the Prophet (blessings and peace of Allah be upon him)) said: “I am closer to Moosa than they are.” So he fasted on that day and issued instructions to fast on that day. Fasting always brings incredible rewards, but fasting on the 10th of Muharram is even more rewarding. Abd-Allaah ibn ‘Abbaas (may Allaah be pleased with him) said: When the Messenger of Allaah (peace and blessings of Allaah be upon him) fasted on the day of ‘Ashoora and told the people to fast, they said, “O Messenger of Allaah, this is a day that is venerated by the Jews and Christians.” The Messenger of Allaah (peace and blessings of Allaah be upon him) said, “Next year, if Allaah wills, we will fast on the ninth day.” But by the time the following year came, the Messenger of Allaah (peace and blessings of Allaah be upon him) had passed away. 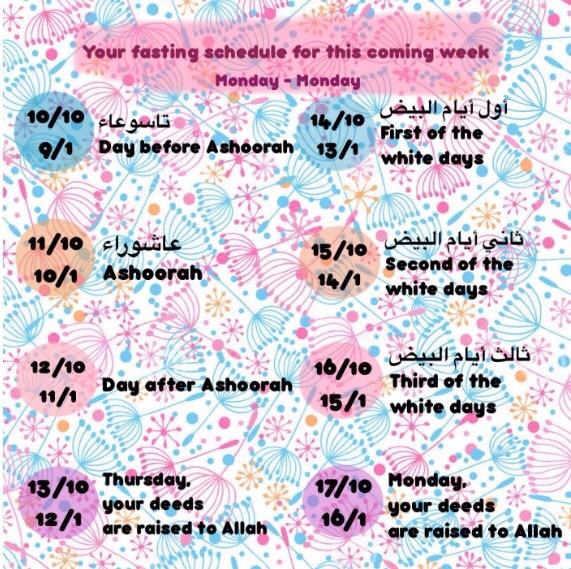 Therefore, try to fast during these two days, and if you cannot then encourage others to do the same. And while you’re at it, here’s a little fasting calendar/checklist I’ve made for you. P. S.More on fasting here. Are we ready for the Ramadan Marathon?